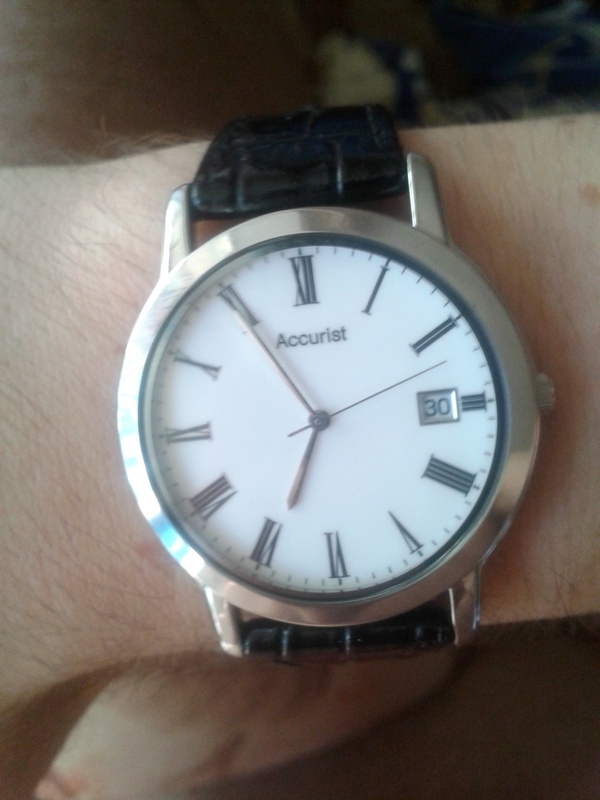 Classic good looks from this gents Accurist. Roman numerals set upon a crisp white face and soft brown leather strap make this a must buy. This watch is actually quite nice, looks pretty simple. The numerals and indicators is very easy to read. Comfortable enough to wear everyday and stylish enough to wear on those special occasions. It feels ok, no bad. It outlook sounds great. Any the same time, watch strap doesn't make people uncomfortable. However, it still has some weaknesses. The date show on the watch can not change. It means it doesn't work. Very nice looking watch. Good easy to read bright dial and its thin so it doesn't look too big and chunky on a small wrist. Always had Accurists as an option for general daily wear and am very happy with this purchase. This is a classic style dress watch, but can equally be for daily wear, with a clear white face, traditional roman numerals (which I can easily read without my specs!) and a smart patent leather black strap. I've purchased it as a chritmas pressie for my partner, who is yet to see it, but if he doesn't like it, I'll wear it myself as I really like it and it doesn't look out of place on a female wrist. Lovely design.